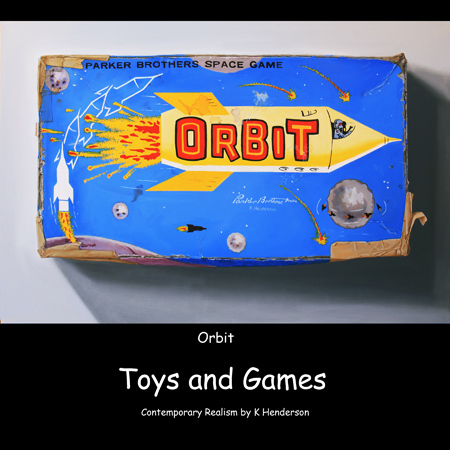 I recently made an online book showing 22 of my Toys and Games paintings.No, the physical book is not available for purchase at this time but let me know what you think. I’ve only had a few hours more to work on this painting but I thought I would show the progress so you can see how wild it’s becoming. I quit subscribing to magazines a few years back because I never had time to read them. So I was surprised to receive the April issue of American Art Collector in my mail. I was quite pleased to be included in the article (pg 140-141) about the Salon International at Greenhouse Gallery. 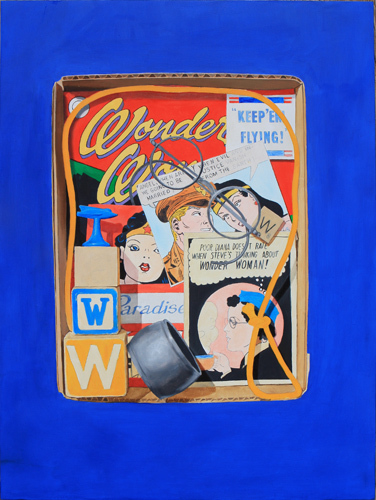 The exhibit opens on April 13 and will be available to view online. I’m working on a few paintings at once. I have nothing new to share so I decided to show a Work in progress. 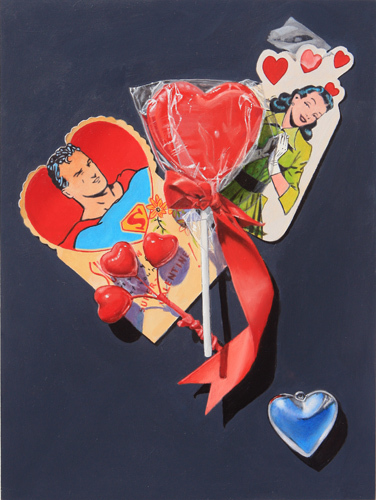 This is another of my Super Hero trompe l’oeils. 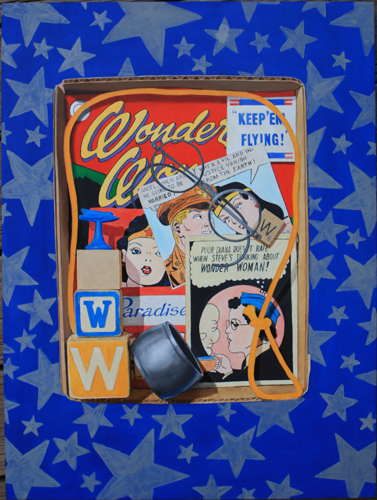 I guess I should call this series ‘Super Heros in a Box’ sense I keep using the same cardboard box to define the elements. What do you think? This photo was taking after 3 days of painting. I enjoyed painting my Felix the Cat pencil box so much that I went looking for more pencil boxes. 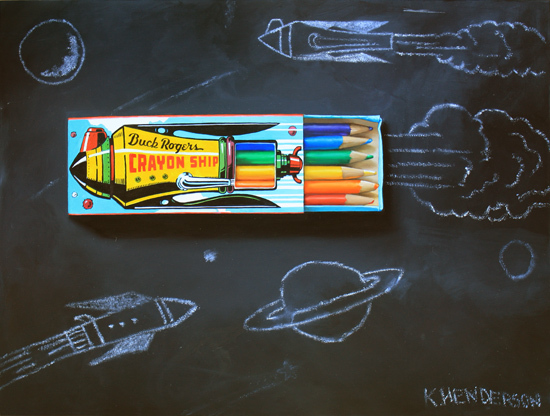 Buck Rogers Crayon Ship caught my eye because of the bright colors and, well, it’s really cool! I’ll be creating another painting using this box because it has great graphics on the back, too. 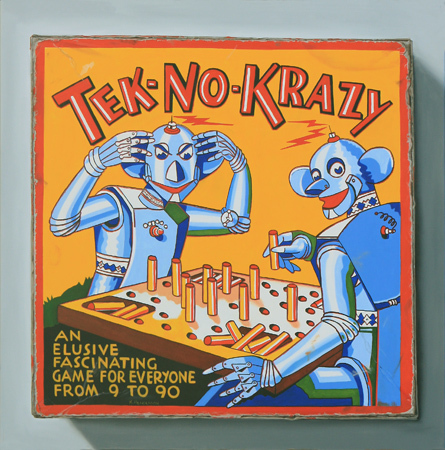 The ‘chalk drawings’ (yes, these are painted with oil paint) are also based on the graphics from this box. I’m ready for winter to be over! 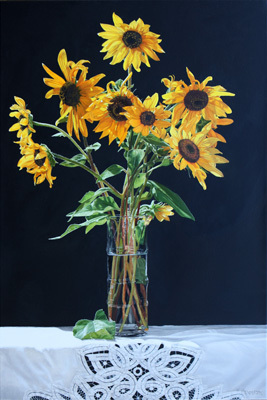 I rarely paint flowers but I had the desire to paint these sunflowers. To me, sunflowers are the symbol of summer. I love the way the sun shines through the translucent petals. Have you ever stopped to look at the way the glass causes a distortion on flower stems? And battenberg lace has always been a favorite of mine. Here’s another game that I had to paint once I saw it. 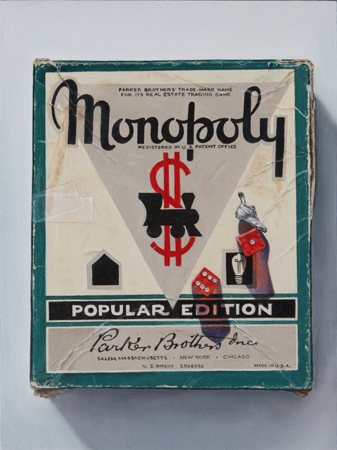 The game is small, about 8″ x 8″ and I thought it deserved to be seen BIG. 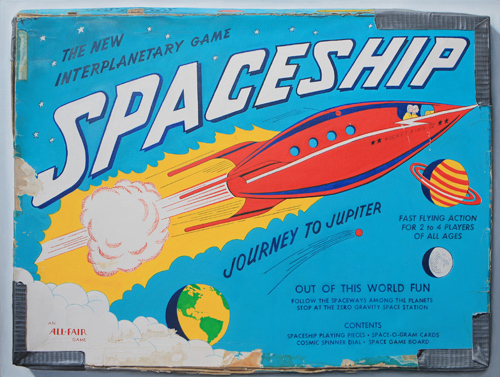 I’m not sure of the exact date this game came on the scene but, obviously, it was when we were still in awe of outer space, robots and flying saucers. Some of us still are.